I can’t really recall why I was so fixated on making kefta but it was all I could think about cooking for weeks. And the same week I make my first keftas, FrugalFeeding makes a scrumptious looking Beef Kofta Curry. It was a culinary sign! Originating from Middle Eastern and South Asian cuisines, koftas (or kefta in Morrocan dialect) are balls of minced or ground meat (usually beef or lamb) that are mixed with spices and onions. Variations are limitless across the globe; from different meat and spice ingredients, from ball to cigar shapes, from grilling to frying to steaming cooking methods… and the kind of sauce it can be served with varies as well. In Turkey alone, there are 300 different kinds of kofta! Meatballs in general are so easy to make as they provide the ultimate freedom in playing around with ingredients. I leaned more toward Morroccan keftas which include onions, cumin, cinnamon, fresh parsley, cilantro and mint. I am not a huge standalone ground lamb person, so I decided to do half beef and half lamb. I bought a pound each of beef and lamb and then made two separate batches to experiment. My first batch I left “naked” and enjoyed the baked keftas without any sauce. I loved how savory and sweet the meatballs were, with a hint of nutty pepper. I served the naked keftas as a meze dish along with other Mediterranean small plates, including some hummus and Marinated Feta with Olives. I also made some Russian Salat, which isn’t exactly Mediterranean but the creamy cucumber, tomato and scallion salad seemed to make a whole lot of sense in my meze platter. 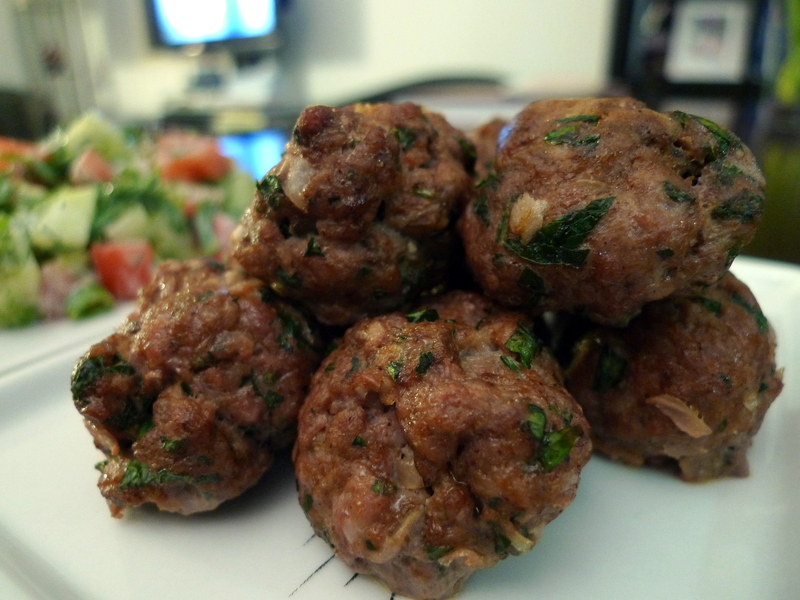 Plus, Natalya has made Russian Côtelettes with the salat before, so figured why not a Moroccan meatball? I am always for fusion cuisine. I had some leftover keftas sitting in the fridge for a couple days, and so Natalya decided to jazz them up a bit by incorporating them in a baked eggs dish for Saturday brunch. She made a variation of our favorite Tomato and Feta Baked Eggs by adding some chopped up keftas and olives to the tomato and feta mixture. It was delicious! For the second batch of keftas (I had frozen half of the meats for later use as I knew I’d get sick of keftas fast otherwise), I decided to recreate a dish I had tried at the lovely French-Morroccan Cafe Gitane in NYC. The dish was spicy organic meatballs in turmeric tomato sauce with boiled egg, cucumber-yogurt and cilantro. Check out my Moroccan Keftas in a Turmeric Tomato Sauce recipe. 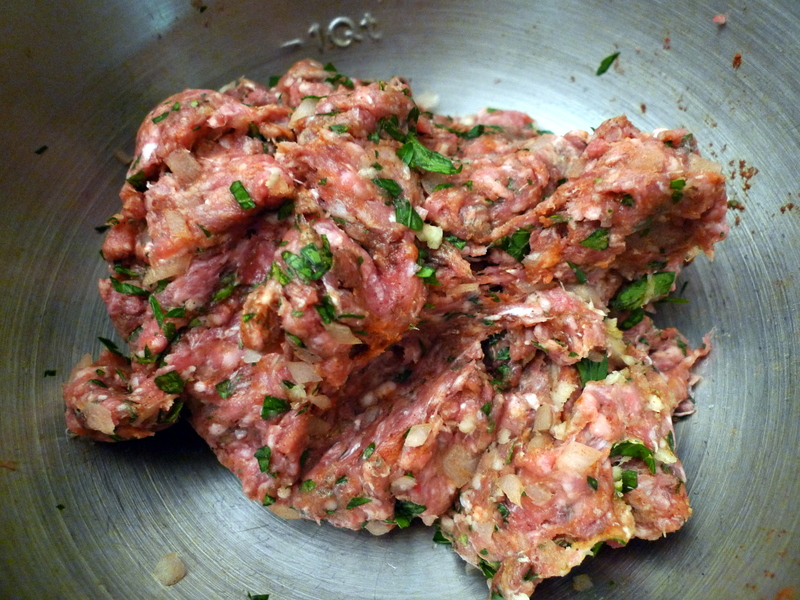 Mix all the kefta ingredients together in a large bowl and let rest for about 1 hour to allow the flavors to blend. Drizzle some olive oil onto a large baking tray (9×13) making sure to evenly coat the entire surface (use your hand to spread the oil). Roll the mixture into balls. It’s a matter of preference what size to make them but I made about 18 meatballs. Roast until firm, for about 15 minutes. 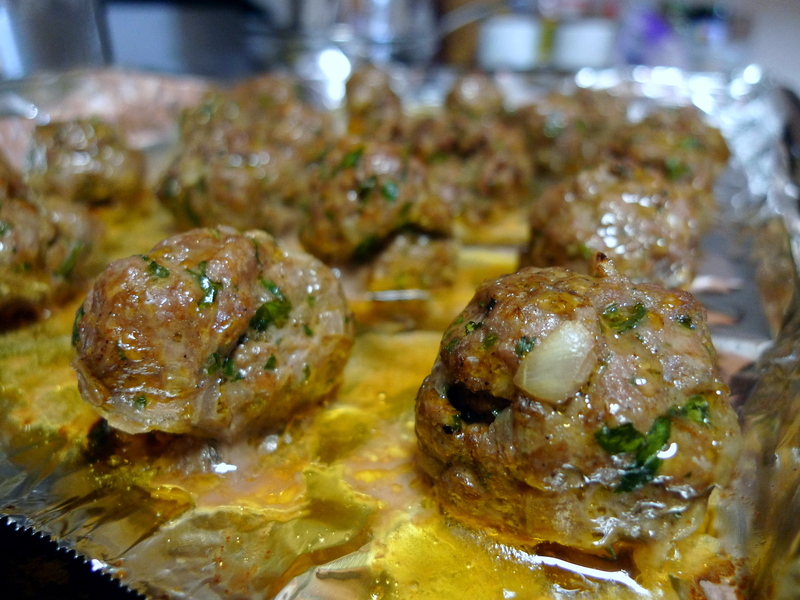 Allow the meatballs to cool for 5 minutes before removing from the tray. Food lovers like me will find this site a great relief…See, No one can make complete perfection in things especially in the case of cooking. Now a days I have turned myself in making varieties of dish derived from my travel knowledge. On my visit to my grandmother’s house at Aberdeen I had this Kefta balls it varies its taste and ingredients as per the country .I made kefta balls with lamb and beef and added veggies like carrot and bell pepper .. Thanks for the mention! These look absolutely delicious. thanks! i going to try making your kofta beef curry next time!